Lazy Girl and Gadget Dad love a nice simple meal on busy days, and Birds Eye have asked our family to be Birds Eye Bloggers, testing their latest products to make life simpler. First up, we tried fish from their Inspirations range. I like fish, but for some reason unless we have a take away from the local chippy, we don't eat it very often at home. Its not always easy to eat it in our house just to Littlest being allergic. Inspirations from Birds Eye are one of a number of meals for those who don't have time to cook from scratch every day but who don't really want to succumb to microwave ready meals.They are also a good alternative to take away that don't contain the fat and salt content of these easy meal options. 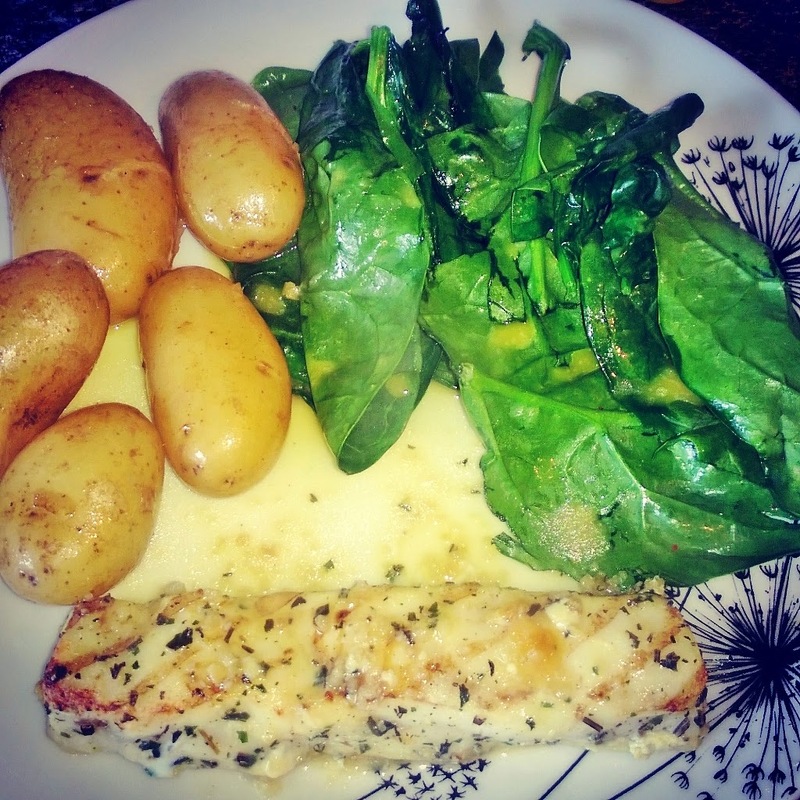 I decided to make our chosen Inspiration fish- Chargrilled with lemon, Rosemary and Thyme and ready prepared- with baby potatoes and a wilted spinach with butter and chili flakes. The first thing I liked is that they cook from frozen, so if you are in a hurry and forget to take them out its not an issue. The amount of times I have thought I'd have something quick for dinner and found out it needed to be defrosted for hours upon hours aren't worth counting! I liked that they were ready prepared for the oven- as I said, Littlest is allergic to fish of every kind, and despite trying hard to avoid him coming into contact with it, even the smallest bit transferred from me or the kitchen to him results in a trip to A&E. With these, they came out the box, and straight in the oven in a tin of their own, so no need to concern myself with wrapping trays to avoid residue. They take 30 minutes at 180, and so were ready at the same time as the potatoes and left me time to prep my spinach. Once cooked, they tasted light, and delicate, complimenting the rest of the dish, and for self confessed meat prefer-er Gadget Dad who doesn't like over powering fish they were just right. The lemon was not bitter or too sharp and the thyme and rosemary complimented it perfectly. At a cost of £3 for two generous sized pre prepped portions, rather than an expensive take away, I feel the price is right for all budgets. They can also be cooked on the Barbecue too. I would definitely try out the rest of the range in the future and must admit these are so simple even after a busy day there's no excuse not to have a nice home cooked meal. With a tny little cheat that will have foodies fooled on Instagram!